Henry V is a history play by William Shakespeare, believed to have been written in approximately 1599. It tells the story of King Henry V of England, focusing on events immediately before and after the Battle of Agincourt (1415) during the Hundred Years' War. 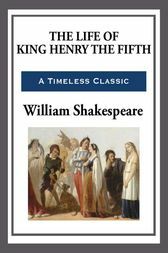 In the First Quarto text, it was entitled The Cronicle History of Henry the fift, which became The Life of Henry the Fifth in the First Folio text.